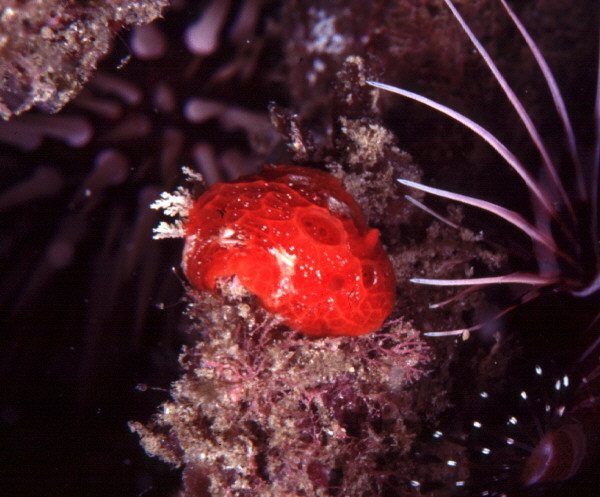 This tiny orange-red nudibranch resembles a small encrusting sponge, the three pits on its back mimicking excurrent pores. The gills are white. Active only at night, it remains hidden under stones or in crevices during the day, most often between 6 and 30 ft. and sometimes as deep as 80 ft. 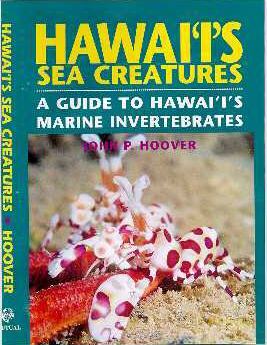 The species name comes from two Hawaiian words: piko ("navel") and kai ("sea"). The three pits reminded the zoologists who described this animal of pits pounded into pahoehoe lava in ancient times, into which children's umbilical cords were deposited. A rare and much larger nudibranch of the genus Sclerodoris closely resembles this species but has only one pit. A small orange-red lamellariid with a smooth rather than pitted surface also resembles it. To about 1/2 in. Photo: Makua, O`ahu. 20 ft.